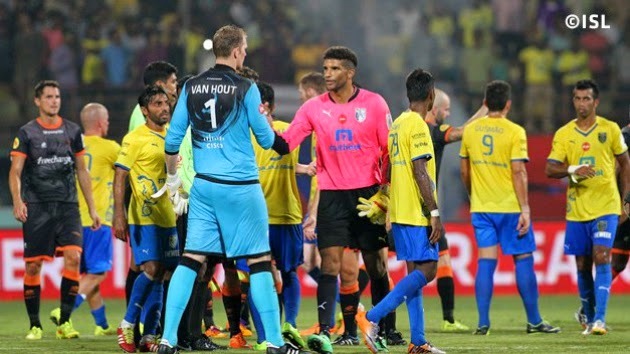 Kerala Blasters FC and Delhi Dynamos FC played out an engrossing 0-0 draw at the Jawaharlal Nehru Stadium in Kochi today. Both teams attacked with purpose, but the defences held firm as the teams split points. The match got off to a lively start with both teams getting immediately into attack mode. Delhi settled into their composed passing game, while Kerala drove forward with pace. The hosts were nearly gifted a goal when the visitors gave away possession just outside their own box. Keeper Kristof Van Hout and defender Shouvik Ghosh however saved the day with the goalkeeper getting a hand on Stephen Pearson’s cutback and Ghosh nipping in to clear.